Have you made a New Year’s resolution to floss every day? How is it working out for you? According to The Washington Post, about half of us make New Year’s resolutions, two-thirds of us have kept the resolution four weeks into the new year—and less than half of us have kept the resolution six months into the new year. How can you beat the odds? The good news is that people who consciously make New Year’s resolutions are much more likely to change their behaviour than the non-resolvers. In other words, people have to want to change. The other good news is that you may be halfway there. According to researchers at the University College London, it takes around two months before a new behavior becomes automatic: 66 days to be exact. So if you made a New Year’s resolution to start flossing regularly and you’ve kept it so far, you’re halfway there. Another way to ensure success: start small. According to B.J. Fogg, a Stanford psychologist, your attempt to develop a new habit is more likely to be successful if you take baby steps. If flossing your entire mouth seems overwhelming, Fogg suggests, start with one tooth a day and work up from there. Find a floss you like, and keep plenty of it in stock. Waxed or unwaxed, flavoured or plain, whatever rocks your boat. 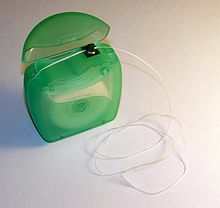 Keep your floss in numerous locations: the bathroom counter, your purse, your desk at work, in front of the TV, next to your PC. Put a sticky note on your bathroom mirror. Set a popup reminder using the calendar app on your smartphone. Ask your family members to remind you to floss daily.